When watching videos of home burglaries, a common thing happens. The burglar notices the camera and then does what you would expect them to— disables it by smashing or stealing it. This is just one reason you should know how to hide a security camera in your home. In this article, I will explain why you might want a hidden camera and give some easy and creative ideas on how to hide a security camera. We tested a few ideas on this list in our popular video. See if you can spot the hidden security cameras before we reveal their location. 1.3.1 Why NOT hide it? Affiliate Disclosure: This page contains affiliate links, which earn us commission from Amazon or other sites at no cost to you. When looking around for ideas about how to hide a security camera, there were surprisingly few resources out there. Most websites looked like they were from the 1990s selling something from the old James Bond movies. Smart home technology makes it easy to have wireless security cameras in your home instead of gimmicky cameras out of a spy kit. So to get started, let’s go over why you would want to hide a security camera in the first place. One of the simplest ways to hide your smart security camera is by covering it in a camouflage skin. Basic security camera skins come in all different colors to help your camera blend into any surroundings, including camouflage. 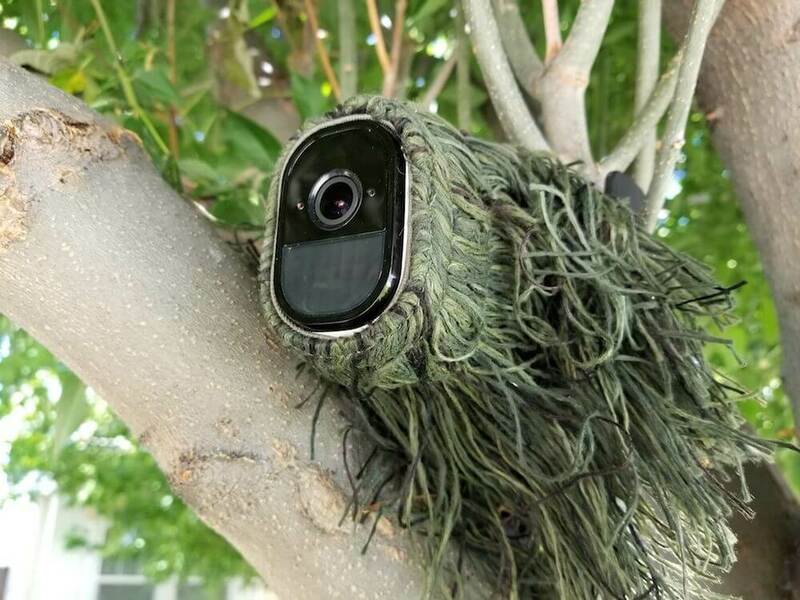 Specialty ghillie skins are excellent for hiding your camera outdoors, just like we did with our Arlo camera. There are plenty of specialty skins and covers to conceal most popular cameras. Here is an example of a Nest Cam disguised as a cute sunflower. This skin won’t fool someone if they look closely, but a busy burglar moving quickly may not notice it. Here is another hidden camera concealer by Dropcases that looks like an alarm clock. Even though most people use their phone as an alarm clock, no one would think that a camera is hiding inside. 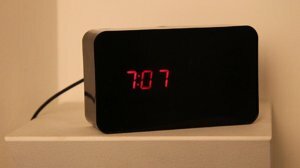 This “alarm clock” does a great job concealing the camera. There are also options for concealing a security camera without purchasing an extra skin or case. Tissue box: By cutting a small hole in your tissue box, you can make an opening large enough for a small security camera to keep an eye on things around the house. As you’ll see in our video above, we cut a small hole in our tissue box and then covered part of the hole with black construction paper. While ours was a pretty basic setup and we could have hid it better, it was still a very subtle way to monitor our home using a security camera. Stuffed animal: Here’s where things can get a little creepy. 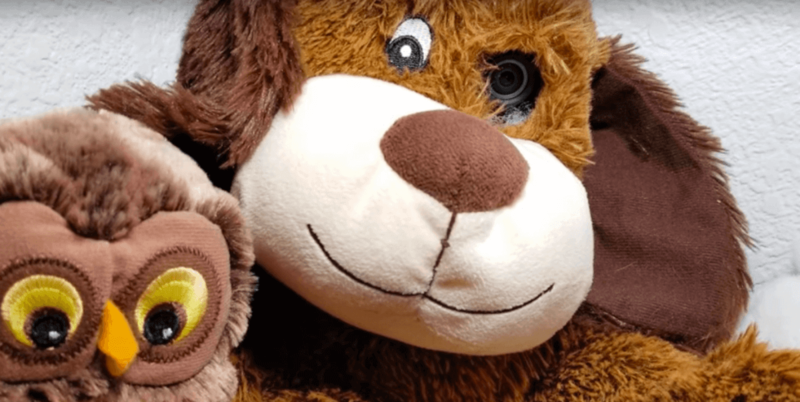 By recycling an old stuffed animal, you can hide a security camera inside the animal and have it look through one of the eyes. The idea behind this is that you would put the stuffed animal next to several others and it would blend in nicely. If you look closely, the camera is probably be visible, but most of the time it would be hidden well. Anyone who sees the camera won’t be able to un-see it since it’s pretty scary looking. Bookshelf: I’m a big fan of bookshelves, especially those from Ikea. We have a Kallax shelf in our front room that we fill with books, picture frames, and decorations. It looks nice, but it’s also busy enough to install a security camera without anyone noticing it. Most homes have bookshelves, so reorganizing them so that a security camera can fit typically isn’t too complicated. Install it high: This tip could also apply to outdoor cameras. Placing your security camera up high not only allows it to see a wide field of view, it also makes it more difficult for guests to see it. Just be careful not to place it too high or it will only record the top of your guest’s heads. Birdhouse: We recently hid an outdoor security camera in a basic $5 craft birdhouse from Walmart. The top was glued on, but once we pulled that off and put in a battery-powered Arlo, it was all set up and ready to keep an eye on our outdoors. The birdhouse hid our camera effectively and with very little effort. Plants and trees: One of the first things that come to mind when thinking of how to hide a security camera is using plants and trees. Most homes have a few real or artificial plants already, and if you don’t they are not too expensive to add. Once you have the plant picked out, there are some tools to help conceal a camera in a plant or tree. You can use a ghillie skin to camouflage the camera, combined with a twist mount for attaching the camera to the limbs. There are plenty of aesthetic and practical reasons to hide a security camera. Don’t let burglars tamper with your camera. This is possibly the biggest argument for figuring out how to hide a security camera. If intruders see your camera, they could steal or smash it. Those who have cameras with local storage will lose any footage of the burglar. If your security camera doesn’t upload the cloud, there is no doubt that it should be a hidden camera. Get an unedited view of your home. When a cleaning service or babysitter comes over, it could be to your advantage if they don’t know that you have cameras in your home. With a camera sitting out in the open, it’s a clear indicator of where not to do mischievous things. A mean babysitter will just act nice in front of the cameras and be mean everywhere else. If you have issues with teenage vandals or troublemakers, hiding a camera outside could help you catch them in the act. Keep your home looking nice. The first reason to hide cameras is that they can be an eye sore compared to your home decor. It’s easy to set up a security camera on a kitchen counter or entertainment center without putting much thought into it, but hiding the camera can give you a good view of the room while still out of sight. Guests can feel pretty awkward when a camera is pointing right at their face. However, there is also the argument that keeping the camera easily visible is a good deterrent. This may be true with outdoor cameras or those that offer two-way voice. The sight of a security camera may be enough to scare off criminals who are scouting for a house to break into. One study by UNC Charlotte found that burglars look for outdoor security cameras and are less likely to target homes that have an alarm system. Newer cameras have two-way voice (a microphone and speaker), making it easy to tell the intruder that you are calling the police. This is a great way to scare off burglars, especially if they don’t know where the sound is coming from. You can also get a camera with a siren, such as the Canary, or have your cameras trigger an external siren using SmartThings or similar home automation. As you can see, it depends on your circumstances as to whether or not you want to hide a security camera. We have a visible camera outdoors and a few hidden cameras indoors. Now that you know how and why to hide a security camera, you’re probably wondering which camera would be easiest to hide. There are quite a few options for WiFi cameras that can keep an eye on your home, while still being easy to hide. Arlo Pro’s wireless cameras offer rechargeable batteries, making it easier to hide them since there are no cords in the way. 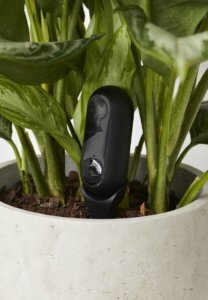 Because the Arlo cameras are white, it can be difficult to hide it in a plant, which is why they made skins to cover the camera and help it blend into its surroundings. 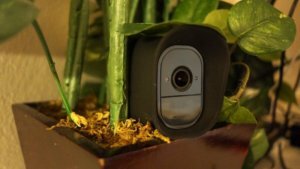 One of the big perks of hiding the Arlo Pro is that so many skins and cases are created both by Arlo and third-party manufacturers, offering plenty of affordable options for hiding your security camera. 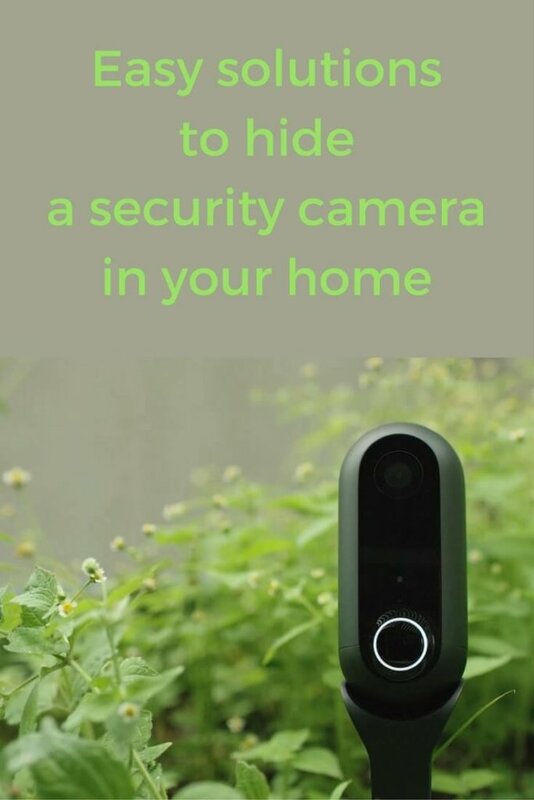 There are quite a few solutions in the community forums for successfully hiding Arlo cameras. Note that you may also want to opt for the updated Arlo Pro 2 instead. We compared it with the Arlo Pro and the main difference is 1080p footage, along with a few upgrades that only work when plugged into power (continuous video recording, 3 second look back, and motion zones). If you’re looking for an indoor budget camera, you can’t beat Wyze. The camera has both WiFi and local storage, 1080p footage, two-way talk, night vision, and more. What’s surprising with all of these features is the price: Wyze Cam is $25 after shipping. No, we didn’t forget a zero, it’s literally twenty-five dollars. 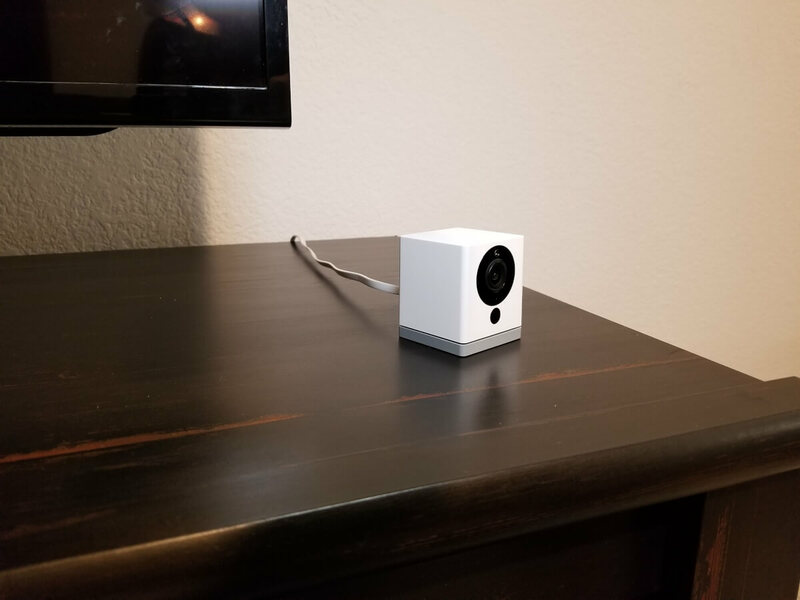 We tested Wyze Cam extensively and even compared it to Nest and Arlo and found it to be high quality and competitive. While Wyze Cam has an extendable base, it can also fold to a small square as pictured. It’s very low profile and small, which makes it a great pick for a hidden camera in your home. 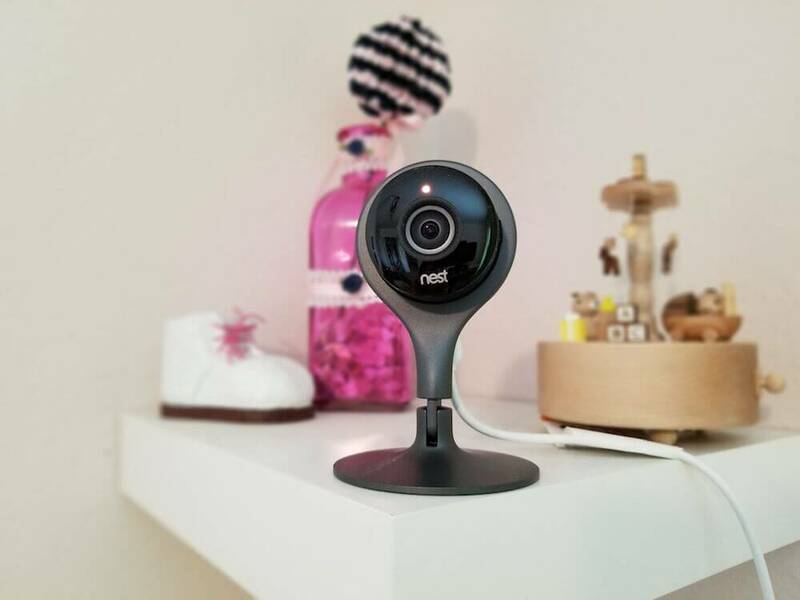 If you use other Nest smart home products, then Nest Cam could be a good option of a camera to hide around your home. Nest Cam works within the same app as your Nest thermostat, lock, doorbell, and security system. 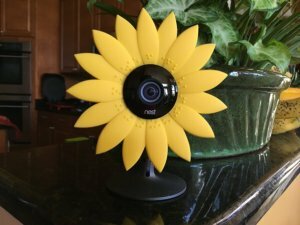 While the camera has to be plugged into an outlet for power, it has several cases and skins for disguising it in your home (including the alarm clock and sunflower shown above). Nest doesn’t offer free cloud storage; it only has a 2 hour look back of images on the free plan. If you pay for Nest Aware, then you’ll get a timeline of 24/7 continuous cloud storage. This is the benefit of keeping Nest plugged in and paying for its subscription: you don’t miss any footage since it doesn’t just record when there is motion like its battery-operated competitors. There are also several outdoor Nest Cams, and we compare all of your Nest Cam options at this link. One hidden camera option is Canary Flex. 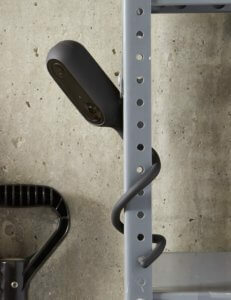 This security camera is very sleek and designed to blend in with its surroundings. It works with the existing Canary camera, but the original Canary isn’t required for Canary Flex to work. It can work plugged in or on its rechargeable battery, so it’s easier to hide anywhere. It is also weatherproof for indoor or outdoor use. You can buy a compatible stake or twist mount, which makes it easy to secure the camera right into a plant or tree. If you’re looking for a tiny WiFi spy camera, you’ll definitely want to look into Conbrov’s Mini WiFi Cam we recently tested. It measures less than an inch on each side, so it’s definitely small enough to hide anywhere. You can insert a microSD card view it live within the app. Note that it is only compatible with 32GB microSD cards, not up to 128 as they advertise. We couldn’t get the camera to set up correctly and contacted Conbrov, who let us know that 32GB is the max, despite what their product description on Amazon says. It has motion detection and night vision just like the other cameras we listed, but the night vision wasn’t very reliable for us. You can’t manually toggle it on and off, which is a bummer because it kept turning on when we used the camera. The software had other bugs as well; hopefully Conbrov will improve the app as time goes on because this tiny camera is impressively small! The Mini Cam comes with a magnetic clip for easy installation. Note that wherever you place it, the hidden camera will only work for one hour on a battery. So if you’re not using it to record short events, you will want to keep this camera plugged in. Canary Flex, Arlo Pro, and all of the options above are great when you’re exploring how to hide a security camera, either indoors or outdoors. Both Canary and Arlo have two-way voice, rechargeable batteries and magnetic mounting features. No matter which camera you buy or where you decide to hide it, review the footage frequently and ask yourself if it’s easy to identify faces. This is the most important factor when hiding a security camera, as it can help you identify intruders after a break-in. What are your solutions for how to hide a security camera? Let us know in the comments below!